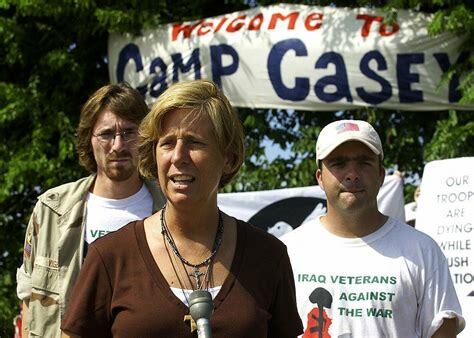 Cindy Sheehan is camping out in front of the President’s property in Crawford Texas as part of a publicity stunt to accuse George Bush of killing her son in Iraq. Cindy Sheehan has a home on the internet that you can visit. Here you will find George Bush called every name that a flaming Leftist can throw at someone. I surveyed her writings and her view of the Global War on Terrorism. Her views seem to dovetail nicely with Michael Moore. It is no surprise that she is associated with MoveOn.org. She always calls the President “George” not President or Mr. Bush or anything showing respect for the office or the man himself. Cindy Sheehan explains her son’s Stories from the Front as that of a young man that joined the Army in May of 2000. She gives no indication of his schooling or specialty in the armed services. He—like all young men—had hopes and dreams about what his experience would be like during his enlistment. If Mrs. Sheehan’s description is accurate, her son did not quite know what military life is really like. His expectations may not have been realistic. 9-11 changed things; suddenly, her son couldn’t do all the things that his recruiter had promised. Duh! After Casey enlisted he knew I was upset. He told me, “Mom, you don’t have to worry, Sgt. (I forget his name) told me that since I scored so high on the ASVAB (military competency) test, I will never see combat, even if there is a war. I will only be in a support role.” I can still hear his voice saying those exact words to me. Those words chilled me to the bone then, and have haunted me since 9/11. First of all, because I thought Casey would be sent to fight terrorists (and “terrorists”) wherever they might be, and I could see George and his warmongering band of neocons rushing us into a crazy invasion of Iraq. I finally got on to speak for my 82 seconds (all the time Larry King Live could spare for the peace message) about how this war is a catastrophe and how we should bring the troops home and quit forcing the Iraqi people to pay for our government’s hubris and quit forcing innocent children to suffer so we can allegedly fight terrorism somewhere besides America. How absolutely racist and immoral is it to take America’s battles to another land and make an entire country pay for the crimes of others? To me, this is blatant genocide. How dare we export our brand of flag-waving death and devastation to a people who have been through so much already? It wasn’t bad enough that our sanctions killed tens of thousands of Iraqis before we even started an active aggression against them. Now we have to create confusion, chaos, and disorder there. How dare our president and Congress, and we Americans, allow this to continue? He hasn’t had a loved one killed in this enormous tragedy of a war, nor does he have a loved one in harm’s way. It has not affected him personally one bit. What skin is it off McCain’s nose if our troops remain for a highly unlikely rosy outcome at the cost of thousands of more lives? Cindy is worried about America. In her essay, Where Do I Live?, she wants to know what you will do “When, God forbid, the jack-booted thugs come pounding on their door some midnight?” Sorry Cindy but Waco was when the other party was in power. Eric Hogue asks about the Sheehan children.